15 NOVEMBER 2013 / TANAUAN, LEYTE ALIVE. 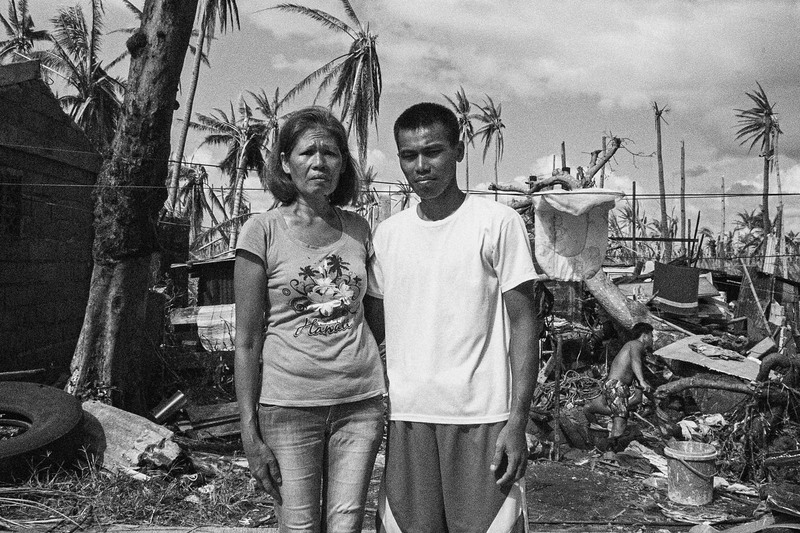 Luzviminda Abuyot and her fifth son Rodolfo, one of ten, survived Typhoon Yolanda. There are ten children in the Abuyot family: Petrito Abuyot, Michael Abuyot, Joey Abuyot, Mark Anthony Abuyot, Rodolfo Abuyot (right), Aiza Abuyot, Luisa Abuyot, Rocky Abuyot Aileen Abuyot and Maribel Abuyot. Their father died three years ago. Their mother Luzviminda (left) is alive, and so are all 9 children who survived Yolanda in Sto. Nino, Tanauan, Leyte. The National Disaster Risk Reduction and Mitigation Council reported at least 597 died from Tanauan alone. Food is scarce, houses were shattered, and there is little way to communicate from Tanauan to the outside. Rodolfo has a message, to his sister in Riyadh. Little sister, he says, little sister, don‘t worry about us. All of us are here. All of us are alive. We lost the house. We don‘t have food. Don‘t worry, little sister. We will survive this. We can do this. Keep working. Mother is here. Your siblings are here. Your big brothers are all here, and we are all alive. We thank the Lord he kept us alive. It‘s true we have no home, and that finding food is hard. It doesn‘t matter, don‘t worry little sister, don‘t let it affect you. Keep doing what you‘re doing. We are alive.